A 10-year-old girl undergoing chemotherapy at Stony Brook Children’s Hospital is making chemo treatments more comfortable for other children, with an assist from two New York Islanders hockey players. Sophia Espiritu’s cancer treatments are a little easier when she wears a special shirt designed to access the medical port in her chest. One day while she was receiving chemo, she looked around and noticed she was the only kid wearing one. She wanted to help other children going through a tough time. So Sophia decided to raise money to buy shirts for other Stony Brook Children’s patients to wear during chemo. Her Shirt and Share drive purchased 700 shirts that are helping kids cope with cancer. A port, implanted under a patient’s skin, make it easier for healthcare practitioners to draw blood samples and administer drugs to the patient. With the ComfyChemo shirt, the patient doesn’t have to take their shirt on and off during a treatment, because the shirt’s front zippers give easier access to the port. Sophia’s initial goal was to raise money for 100 shirts. She figured classmates and staff at Tamarac Elementary in Holtsville would help out. With support from Tamarac Elementary’s school nurse Bernadette Murray and principal Michael Saiden, the fourth-grader made a video that went viral on social media. New York Islanders Matt Martin and Anders Lee heard about Sophia’s fundraiser and stepped up with funds for 100 shirts. But Sophia wasn’t done yet. She raised an additional $12,800 and bought 700 shirts in a variety of colors and sizes ranging from toddler to young adult. Instead of asking for toys or electronics like some kids might, all Sophia wanted for her birthday was to get the shirts to young patients who need them. 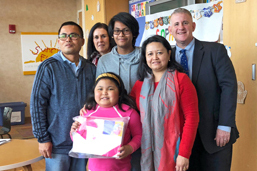 So Sophia celebrated her 10th birthday on Dec. 5 with a party held at Stony Brook Children’s. Sophia loves Harry Potter, so the room was decorated with characters from the mythical Hogwarts school. She personally opened the bags and passed the shirts out to her fellow chemotherapy patients. 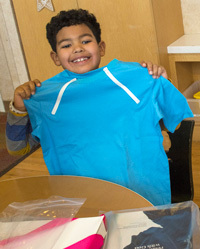 Sophia’s Shirt and Share fundraiser has impressed everyone with its success and won admiration for this kid with a big heart and a great idea. Sophia’s parents, Melody and Roger, say they are proud of her courage and kindness. In March 2018, Sophia was diagnosed with Langerhans Cell Histiocytosis (LCH), a condition in which immune cells build up abnormally in the body, damaging tissue and sometimes causing lesions. Sophia had a lesion in her brain. 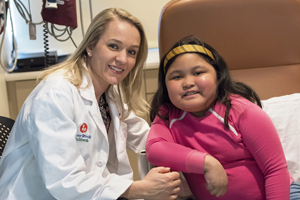 Although there is no longer evidence of the disease in Sophia, Stony Brook Children’s pediatric oncologist Laura Hogan, MD, says she will continue chemotherapy treatments until June.